Night sky photographer Tyler Leavitt used a wide-angle lens to capture this photo of the green Comet Lovejoy from Las Vegas, Nevada on Jan. 7, 2015. The comet is shown first in a wide-angle view with the Orion constellation, with the inset box showing the view from a telephoto lens. Amateur astronomers captured amazing photos of a bright comet as it raced across the sky this week. The comet was officially catalogued as C/2014 Q2, but many refer to it as Comet Lovejoy, named for the amateur astronomer Terry Lovejoy who discovered it in August 2014. On Wednesday night (Jan. 7) the comet reached its closest distance to Earth at about 43.6 million miles (70.2 million kilometers) away. The comet is traveling on a particularly elongated orbit and likely won't be visible again for another 8,000 years. 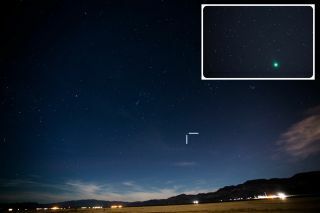 "I ran out tonight to try and grab a glimpse of Comet Lovejoy," Leavitt told Space.com via email. "Some high clouds were moving in, but I managed to grab a couple of photos." Leavitt was able to snap one photo with a wide-angle lens and later drew in a box around the comet to help it stand out. For a second, close-up photo he used a telephoto lens and a tracking mount. "I was obviously still too close to the Las Vegas lights and had a hard time seeing it without binoculars," Leavitt said. "With the aid of binoculars it was readily visible as a fuzzy patch with a green tone. I couldn't see a tail, but a small ion tail was captured in the telephoto shot." Another amateur astronomer, photographer Chris Bakley of Cape May, New Jersey, took a different approach to capture a photo of Comet Lovejoy and the Orion nebula on Wednesday night. Bakley used a sheet of foam to create the double exposure and get both celestial objects into the same photo. Astrophotographer Chris Bakley of Cape May, New Jersey, made a double exposure to create this view of both Comet Lovejoy and Orion Nebula on Jan. 7, 2015. Amateur astronomer Terry Lovejoy discovered the comet last year from his roofdeck observatory in Australia, and it's the fifth comet he's discovered since 2007. The apparent green color of the comet likely comes from cyanogen, a poisonous gas that glows green when sunlight hits it. Stargazers can pick out the comet by looking for it along a south to north path almost perpendicular to the celestial equator. The comet will pass through the Eridanus constellation and enter the Taurus constellation by Friday (Jan. 9). The comet will also pass through Aries, Perseus and Triangulum before speeding off toward the sun. By the end of the month the comet's brightness will have faded, but it should still be visible with binoculars and telescopes through the end of January. Editor's note: If you snap a great photo of Comet Lovejoy, or any other night sky view that you'd like to share for a possible story or image gallery, you can send images and comments in to managing editor Tariq Malik at spacephotos@space.com. See more amazing night sky photos by Space.com readers in our astrophotography archive.